Just recently, Erin Ward and I presented “Raise the Paddle, Raise the Bar: Realize your true event ROI” at #nynmedia’s Fundcon 2019 in downtown Manhattan over 100 nonprofits looking to build efficiency in their fundraising plans. There were panels of industry experts and fundraisers in the trenches. Erin and I were honored to be selected to create a short, interactive presentation on how to find more donors at your event, while raising more money in less time and creating a great experience for your donors. I asked the questions, “How many people have a gala?” 90% of groups were doing some sort of gala. I then asked, “How many are doing auctions?” 60% raised their hands. Then, “How many are doing a paddle raise?” 10%…that’s right 10%. I about fell off the stage. This means, 50% of the audience that is spending the time, energy and money to create a special event, they are leaving 10’s of thousands of dollars laying on the table at your event and 100s of thousands in donors pockets beyond the event. Now I don’t know why they are not utilizing this amazing opportunity for at event fundraising. You wouldn’t approach a major donor with no strategy for the ask. You wouldn’t send out a grant unless you fully understood what the grantor was looking for. You wouldn’t send out a direct mail piece that wasn’t expertly crafted. WHY ARE YOU APPROACHING YOUR BIGGEST FUNDRAISING EVENT AND DONOR IDENTIFICATION OPPORTUNITY WITH NO STRATEGY AND PREPARATION? Of course you will be scared of doing something you may have seen, but not fully understand how to implement. If you have read this far, I thank you and want to reward you with some valueable take aways. Crickets…How do you prevent crickets? The first strategy is to have a seeded gift. Approach a major or invested donor and ask them to be your lead gift. Make sure they raise the paddle when the ask is being made. This will prevent that icky cricket moment. Paddles, Tech, Envelopes: You need to have a tool for giving. We love the paddle. Yes, analog. Yes, another item to carry. It does not need wifi, a charge, doesn’t allow for outside destraction and loss of focus, and allows for reactionary giving. At registration, EVERYONE get’s a paddle with their name attached to it, pre-swipe of credit card is suggested, so many solutions out their that do this. If you want to go the tech giving route, this is possible, just know the limitations of such. Envelopes? 1-3% are actually filled out…wouldn’t it be great to get 100% engagement? Paddles make this happen. You can design a paddle that slips in a suit pocket or slides into your program, no other things to hold or carry. Our crowds is not giving. Are you having a party or a fundraiser? If you audience is not giving, you are having a party. You have a marketing problem. You need to tell the guests that this is a Fundraiser! Tell them you will have fundraising Activities (Paddle Raise) and who this Benefits. You need to put the FAB in your marketing. Fundraising, Activities, Benefit (more on this in future articles) If you do this effectively, your audience will begin to transform into new philanthropic partners. We tried, but failed… Did you have a seeded gift? Did you have an inspiring story? Did you have an effective asker? Did you have paddles? Did you market effectively? Did you get your board on board? Did you distract your audience with auctions and raffles and stuff? Did you ask for expert advice? If the answer is NO to any of these…of course you failed. It’s like stepping out on a playing field of any sport and not practicing and preparing to win. You will fail. If you want to raise more money, engage more donors and create a great experience, please call us! We can help you make a difference in your event fundraising that can lead to a huge windfall in your future fundraising. We are extending an offer to you that we offered at FundCon2019. Text: GIVE to XXX_XXX_XXXX to receive a FREE 30 minute Paddle Raise consult. We will answer any questions you have on a paddle raise and how you can make it better. If after that conversation you want to engage us to help you, we’d love to serve any way we can. 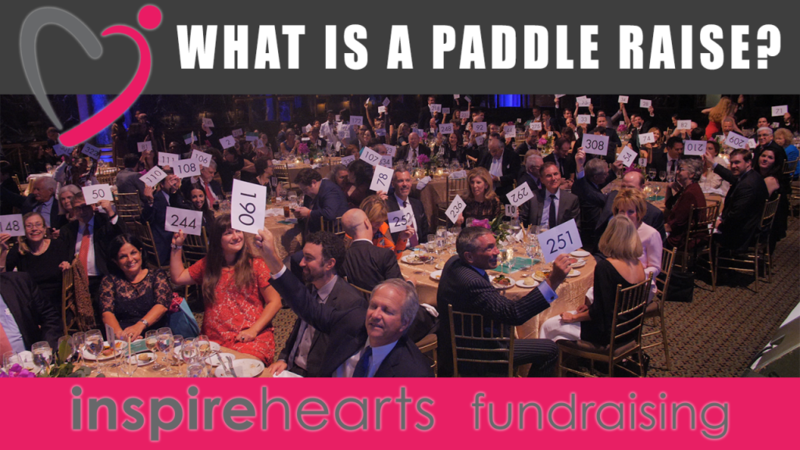 If not, you will have received expert advice on how to have a better paddle raise at your event. Thank you so much for reading all the way through this…if you did you probably need help at your event and are looking for a better way. We have a better way and would love to help. Now, get back to work and go change the world!